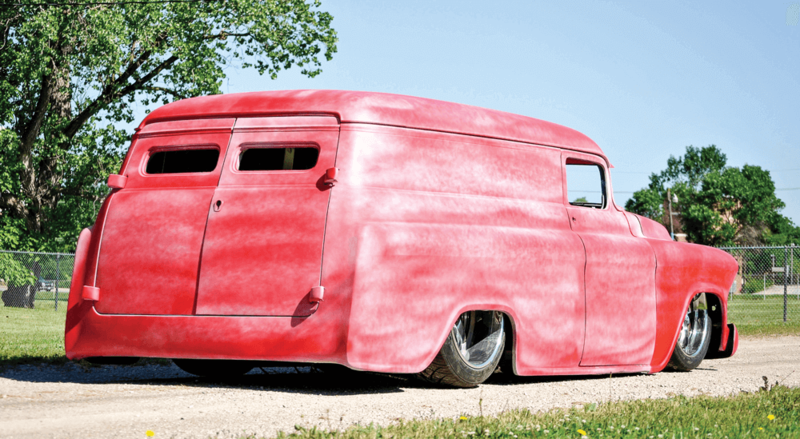 WHEN JIM STUART OF ENID, OKLAHOMA, SET OUT TO START ANOTHER CUSTOM BUILD TO ADD TO HIS ALREADY LONG LIST OF PREVIOUS SHOWSTOPPERS, HE AIMED TO DO SOMETHING VERY DIFFERENT. 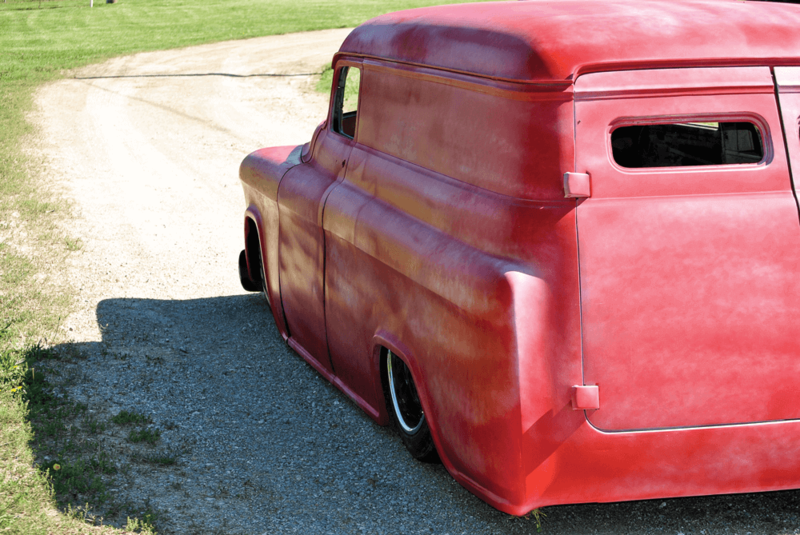 In the fall of 2016 Jim discovered a ’55 panel truck that needed a lot of love. 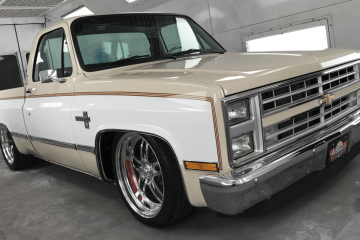 He knew he could transform it by SEMA 2018, and as it seems to go for every SEMA build, the second he brought the panel home, the countdown clock officially started ticking. 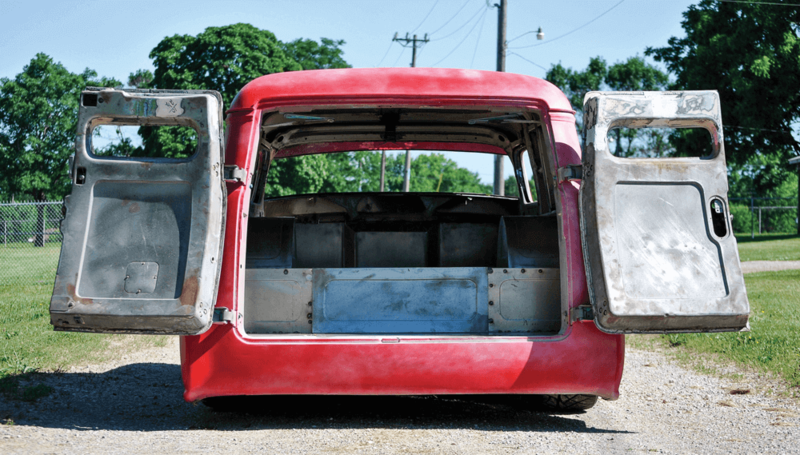 THE REAR BARN DOORS OPEN CLEAR AND WIDE, ALLOWING US TO CHECK OUT ALL OF THE CUSTOM FABRICATION THAT WENT INTO THIS SOON-TO-BE-STREETDRIVEN TRUCK. 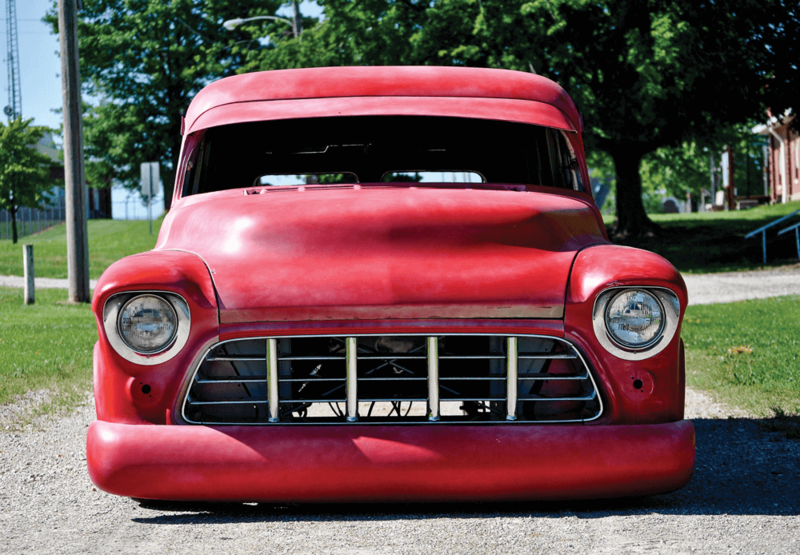 When the panel rolled into Stone Cold Customs (SCC), it became starkly evident how much work it would take to make this truck the jaw-dropper it’s destined to be. First things first, Jim knew that he couldn’t stand to look at the stock-height roof any longer. 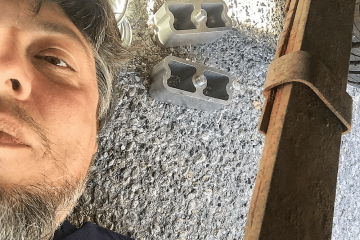 He and his crew began measuring and marking for the roof chop and all of the metal work that accompanies that daunting task; even small chop tops aren’t simple. Stuart planned to take around 5 inches from the ’55, which is definitely considered a major chop that is extremely tedious and labor intensive. 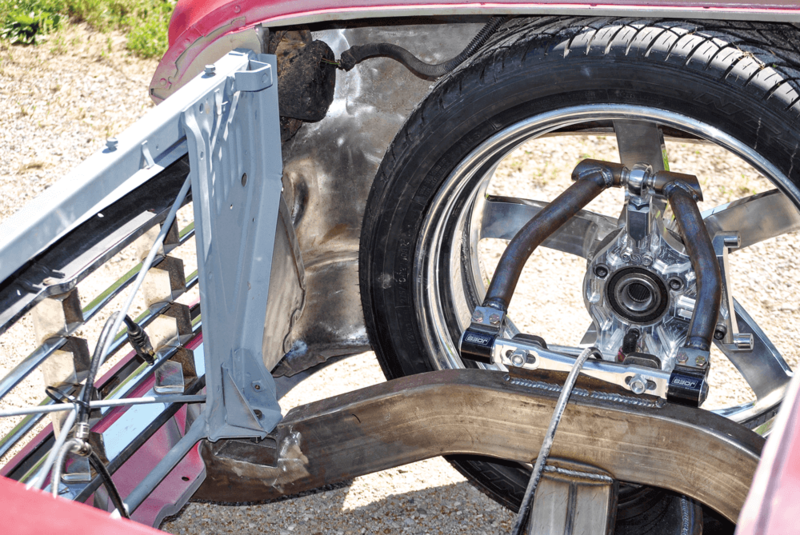 A CUSTOMMADE FIREWALL IS THE ONLY WAY TO GET THIS PROJECT FLAT ON THE GROUND WITH A SET OF 22-INCH WHEELS BOLTED UP. 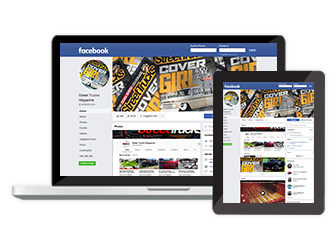 With more than 500 hours slated for roof work alone, it’s easy to see the level of commitment and time this build will consumed personally and professionally. 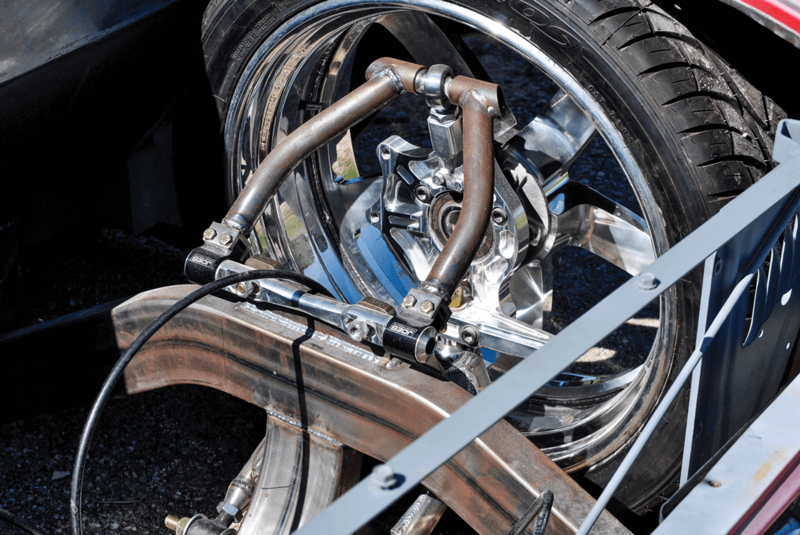 As work on the body continued, the chassis and suspension fabrication began to materialize. 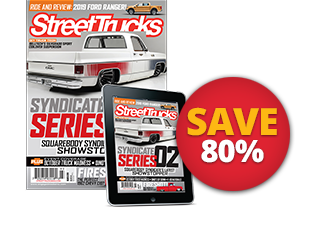 When the SCC crew originally designed their one-off custom frame, the MRC fab frame rails were created to house the 4-link with Watts-link rear setup that will make this beast of a truck roll silky smooth anywhere it travels. 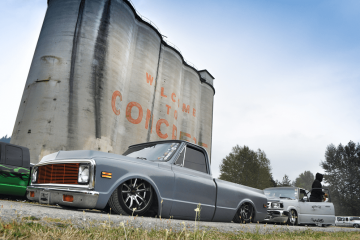 In addition to the frame, SCC fabbed a set custom control arms and installed a large set of front and rear Wilwood brakes, not only for great looks, but to provide more than enough stopping power for a truck of this size. 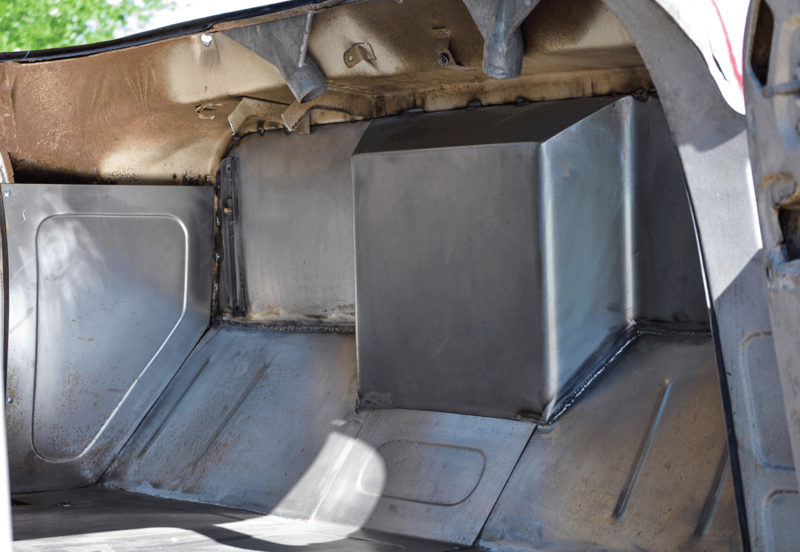 IT’S STILL BARE ON THE INSIDE, BUT AFTER A FEW MORE MILES OF WELDING WIRE, THE INTERIOR WILL BE ADDRESSED. 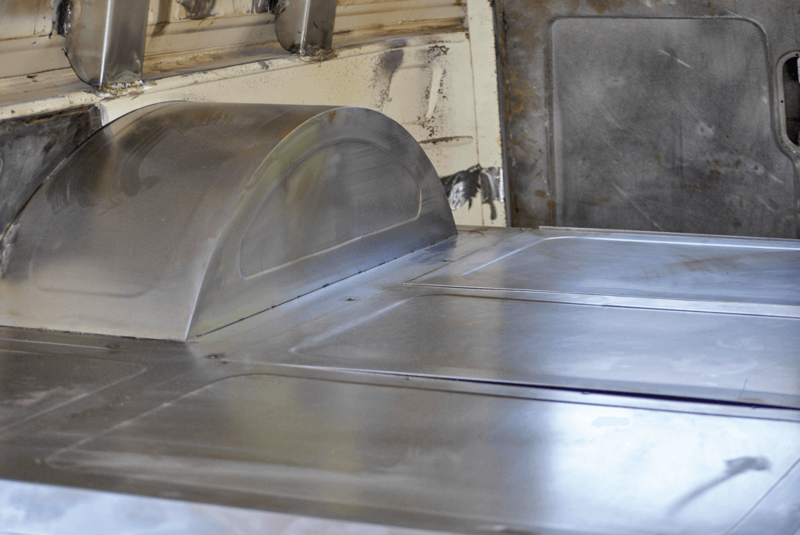 Once the panel’s body was set back on its new chassis, the crew got to work on all of the interior sheet metal work. 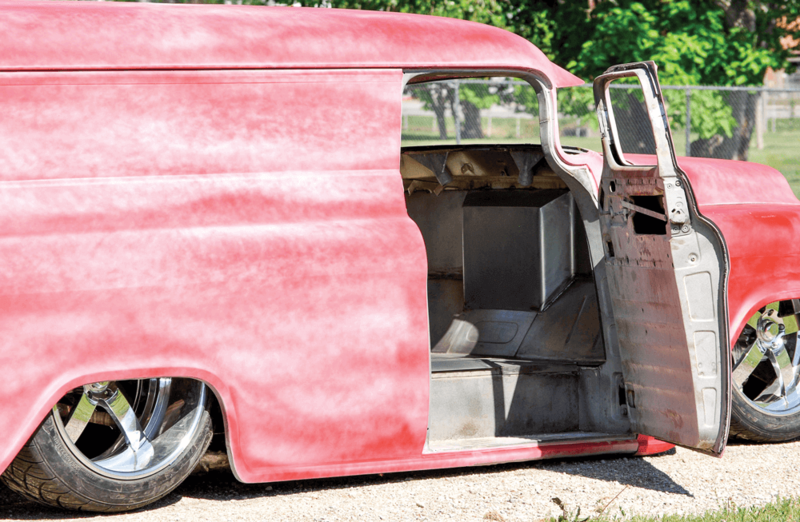 From the custom body mounts to the bead-rolled custom floor, and even the wheel tubs, no details were overlooked during this classic’s overhaul. 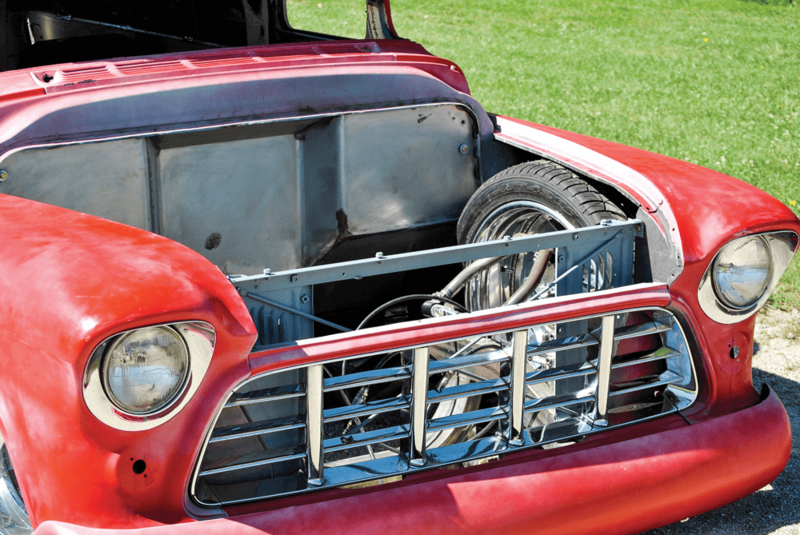 Jim built the firewall to fit the future Chevrolet 454 engine, and that’s when he really started to notice how well everything was coming together. 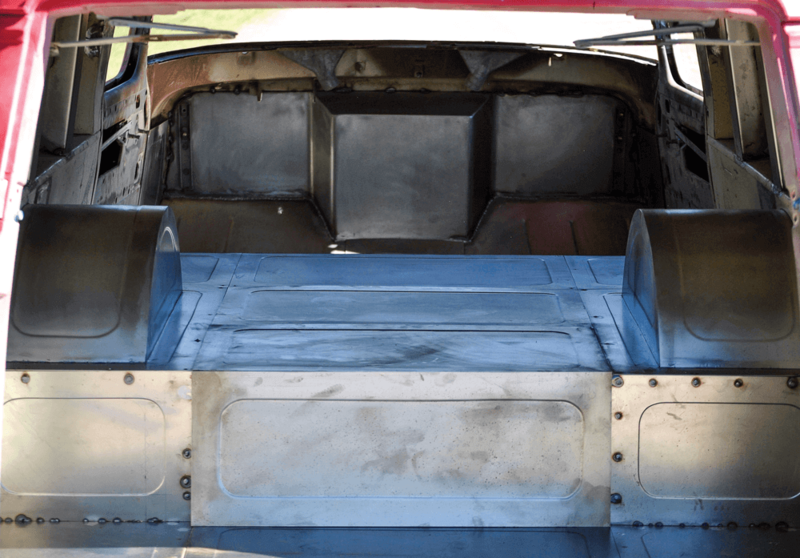 It also began to dawn on him just how much work the crew still has in store if they’re going to finish by the end of October in time for SEMA. A ONE-OFF CUSTOM FRAME WITH MRC FRAME RAILS WAS BUILT IN-HOUSE ALONG WITH THE REAR 4-LINK WITH WATTS. With the Vegas date creeping up, Jim and the SCC crew are busy, but they aren’t cutting any corners. 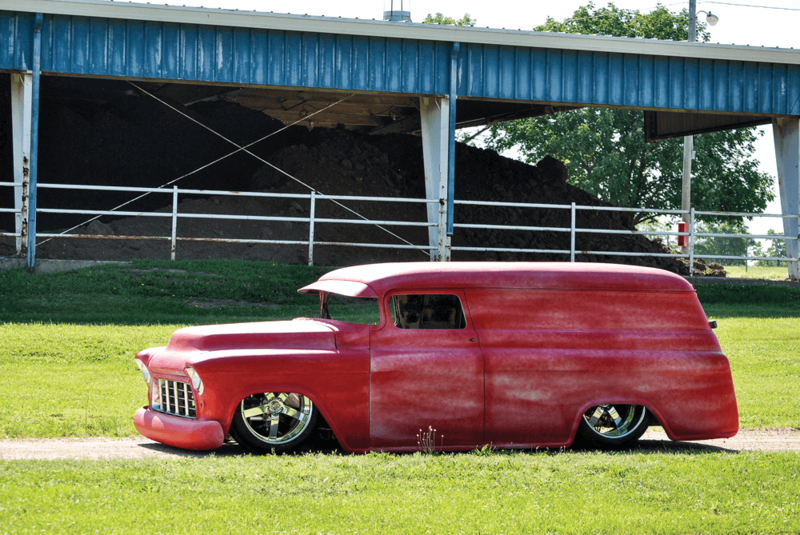 Be on the lookout for the ’55 Chevrolet panel truck named Altered Attitude at SEMA this year, as well as a follow-up feature in Street Trucks when it’s complete. SPECIAL THANKS FROM THE OWNER: “My amazing wife Branda and my family. 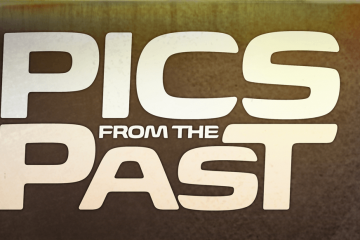 Also, Kade Ludlow, Nate Snodgrass, Richard Potts, Armando Loza, Cody Hurley and Max Heim. I’d also like to thank my sponsors: American Racing, BeCool, ididit, Auto Meter, Tamco Paint, Painless Wiring, Wilwood, Taylor Wires, Visual Impact Performance Systems, Toyo Tires, Fragola, Fluidampr, VIAIR, Slam Specialties , Lokar, Watson’s Street Works, Flowmaster, Steele Rubber Products, Forever Sharp Steering Wheels, COMP Cams, Scorpion Coatings, Trique Manufacturing , Hillco Fasteners, XS Power Batteries, Holley and BG Products Inc.